MOTOCROSS is buried deep in the history of the famous Yamaha brand. Going back to the 1960’s Yamaha released the DT1, the base from which the YZ would later evolve. The DT1 tasted success early in the Motocross world when in 1971 and 1972, Gary Jones would take out consecutive AMA Championships on his DT1 fitted with the complete GYT Race kit. Funnily enough, GYT is now known as GYT-R, Yamaha’s after-market performance line of accessories. In 1973 the YZ was born, and Yamaha would never look back. In the years that followed Yamaha would be instrumental in developing the monoshock, which went on to be found on all motocross bikes. The Reed valve design was introduced to motocross and would improve engine combustion and performance. Liquid cooling was once again first introduced to motocross by Yamaha, and in 1981 the YZ125 would be the first water-cooled production motocross bike. In 1997, Yamaha would again shock the world when it released the first competition based four stroke YZ400, released to compete against the two strokes. Little did anyone realise at the time the effect this bike would have on dirt bikes moving into the future. In 2010, Yamaha would make massive changes to their engine design and re-arrange the cylinder design to be what is described as a reverse fed cylinder design, where air and fuel would come in the front of the cylinder and the exhaust would exit out the rear. This brings us to 2016, and while there are no groundbreaking changes to speak of it is remarkable to see how Yamaha has developed the bikes we know and love. 2016 also marks the iconic brand’s 60th Anniversary, and fittingly Yamaha has released a special edition retro-themed model. When it comes to updates on the 2016 model YZ450F, Yamaha focussed on refinements and making small changes where it matters most to improve the overall performance of the bike. Beginning with the suspension, Yamaha has moved towards a stiffer suspension set-up in the front end. The 2016 forks have stiffer springs, yes that’s right no air suspension here, up from 4.7Nm to 4.9Nm and modified valving to suit. 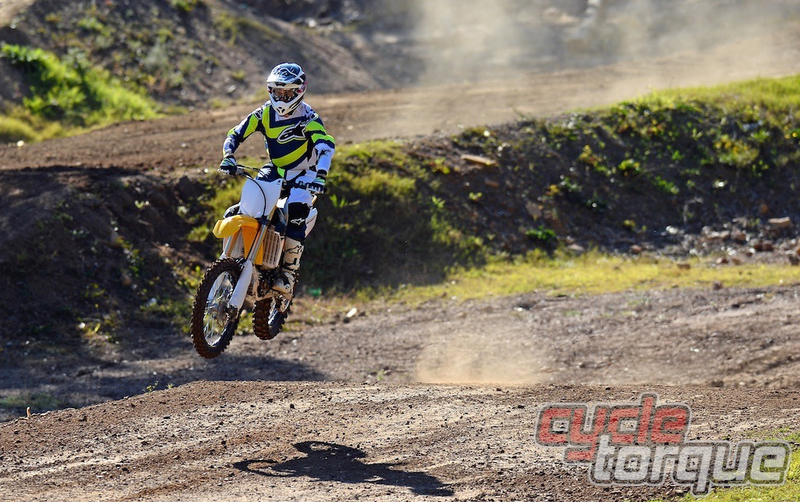 It is also interesting to note that since the release of the current generation YZ450F, in 2014, the front end has been gradually stiffened each year. While they were at the front of the bike, Yamaha engineers made further changes to the triple clamps increasing the offset from 22mm to 25mm. 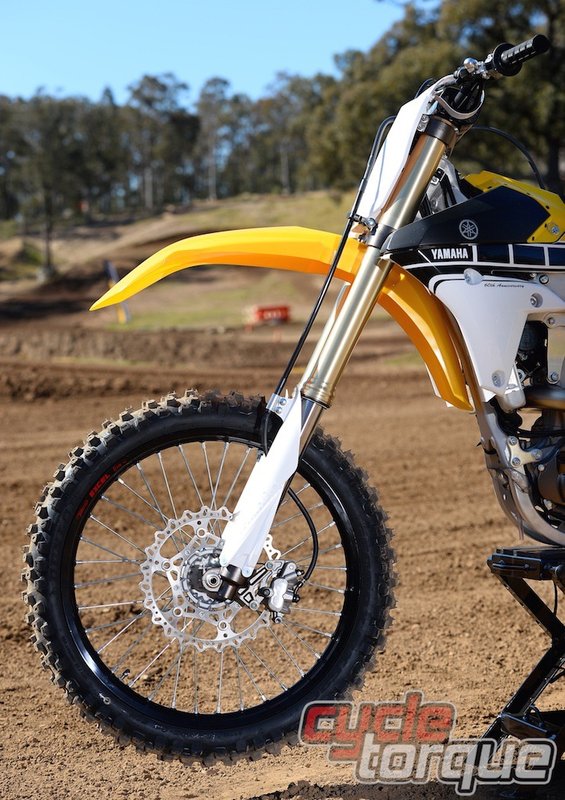 This appears to be an odd change when you consider the potential effects of increased clamp offset, however Yamaha claim it was necessary when combined with its newest suspension and chassis modifications. The chassis receives changes in a few areas, with the focus being on increased rigidity around the swingarm pivot area, where the frame thickness has increased by up to 12mm when compared to the 2015 model. New 2mm thicker aluminium engine mounts add further rigidity, and when combined with the swingarm area changes, Yamaha claims to have improved front end traction and increased front end feel. Speaking of front end feel, after years of wanting, and even similar parts being available in the GYTR after-market catalogue, Yamaha have finally included a 270mm front brake rotor as standard equipment on its 2016 model. In the past Yamaha riders have become used to a 240mm rotor, which to be truthful works effectively, but it however lacks some serious stopping power when compared to an “oversized” 270mm rotor. 450cc engines in today’s four-stroke race-bred machines all have more than enough power, the game here is simply about putting power where it is most useable. New camshaft profiles and valve springs for 2016 are the only real performance based changes on the spec sheet, these items are aimed at broadening the power output and increasing torque, or grunt if you will. Yamaha has introduced a launch control system for use in race conditions off the starting line. It’s activated by holding in a button on the handlebars for four seconds, after which a light next to the button will flash, indicating the Launch mode has been turned on. The Launch mode effectively acts as a traction control type of system without the sensors, where revs are monitored and limited when the rider takes off out of the gates. Once the rider hits 3rd gear, launch mode is deactivated and normal ECU mapping takes over. Other updates on the 2016 list worth mentioning are the 5mm lower footpegs, which very slightly change the rider position, and slightly modified 4th and 5th gear. The gearbox changes are claimed to improve shifting under race conditions, and are similar modifications to those previously carried out on YZ450 desert racing machines. 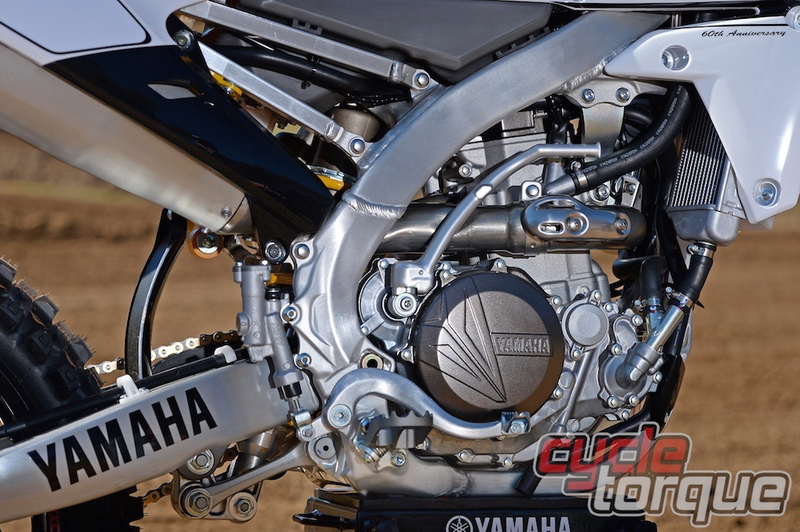 So after going through the specs sheet and the Yamaha tech presentation, it was clear that Yamaha chased stability and predictability in its chassis mods, and a more controllable and rideable engine.But what does all this mean on the track? Well, for starters just because it’s more rideable and controlled doesn’t mean it’s slow. 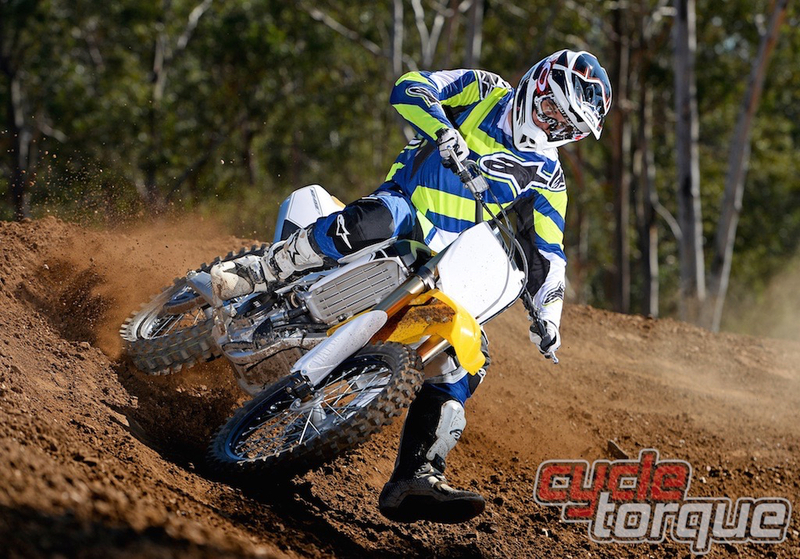 The YZ engine is a ripper, and just like the brochure says it’s easier to ride than ever before. On the track the Yamaha comes to life quite easily and has ample punch right from the bottom of the rev range. Through the mid-range power is plentiful, and if you’re game enough to keep holding it on, the YZ has more than enough power for the average punter when pushed up higher in the revs. Overall the YZ engine is a really fun engine to ride, it’s one of the best in its class with a power curve that can deliver instantly when needed. The new launch control system works quite well in the right conditions, and is easily noticeable. For any potential new YZ owners out there, it is certainly a system which requires some practice and testing time to get it fully figured out, and would be time well spent if you’re chasing those all-important holeshots. After becoming more settled in on the YZ450F, we began to notice the chassis and suspension changes. The firmer feel is apparent and the Yamaha is very stable and predictable around the track. The triple clamp changes and stability mods work well under acceleration and braking where the bike remains calm and tracks well, however it’s now a bit harder to flick around a turn or duck in and out of a tight rut. The KYB suspension offers great adjustability, with the original clicker setting feeling a touch stiff for our 80kg test rider on the day. A few clicks softer on the compression and we felt more comfortable. The KYB Speed Sensitive spring forks continue to offer some of the best rider feedback on the track and give a consistent feel to the rider no matter the track surface. The 2016 Yamaha YZ450 is another brilliant bike from the Japanese powerhouse brand. The engine is a proven fast and reliable package, the chassis and suspension offer comfort and predictability without the fuss of some of the newer, more temperamental products on offer. As expected, the finish of the Yamaha is amongst the best in class. Attention to detail at every end of the YZ makes the build quality stand out from the crowd. The price is very competitive at $11,999, but for an extra $200, the 60th Anniversary Yellow and Black themed bike would look good in our garage.